WordPipe is here, and has many new time-saving features to help you work smarter. As always, WordPipe will read filters from ALL old versions without any changes being required. Fixed grid not being accessible if ribbon could not be created. Fixed uninstall removing user files. populates with helpers to make EasyPattern and regex matching easier. Faster searching - removed duplicate story ranges. Fixed grid not being re-enabled after import. Fixed synchronization bug that caused WordPipe to hang. (x32/x64) between WordPipe and Microsoft Word. Now copes with Word 2013 Unprotect function missing. Fixed error with documents being counted twice. Fixed error with Division by Zero on end of processing run. Fixed file handle error on setting file date. Fixed problems with Read Only Recommend documents. Fixed doubling of search terms every time WordPipe is closed. Installer now does not run WordPipe when running silently. Now supports Open Document Writer file type .odt. OLE and DDE Links are now included in Link Reports in Search Only mode. 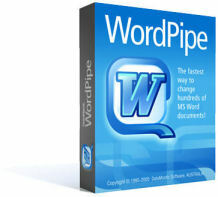 WordPipe changed so that it does not modify the document in Search Only mode. colors, or the actual color used with Word 2007 and 2010.
settings to show or hide Microsoft Word. replacement row is still required, but can have a blank search phrase column. Updating of OLE and DDE links now working. did not re-trigger after the first failure of Microsoft Word. ReadOnlyRecommend test is now error trapped to avoid Microsoft Word errors. Microsoft Word now kept visible better if 'Keep Visible' option checked. File associations now just for .doc, .docx and .rtf files. Reverted to old handling of AutoRun. Fixed error with disabling of AutoRun macros. Improvements to template update code. Fixed bug in Links\OLE processing. search phrase scanning the Inside Hyperlinks location. Improved handling of Microsoft Word restarts. Added ability to update OLE and DDE links. color in Microsoft Word (default is yellow). Added option to keep Microsoft Word visible while running to aid debugging. what changes would be made. these do not appear as square boxes in Microsoft Word. New option to allow highlighted text to be removed. displayed first, and also restores the document's original settings on save. Added missing 'Highlight' column header to .tab export. files not being removed or restored. Fixed bug with Microsoft Word being terminated repeatedly. Now searches Hyperlinks in Footnotes, Endnotes and Comments. Now correctly finds Hyperlinks in Headers and Footers. Office 2007 file extension of .DOC* now supported. supported on older versions of Word. Added Half width/Full width for Japanese text. Fixed the timeout timer restarting at the end of the job. The Cancel button in the Search/Replace confirmation box now cancels the job. switching to/from field codes mode. Properties, Bookmark Names, Form drop down Choices and Document template. Prompt on Replace, with options to replace or skip one/file/job. New Arabic options for Kashida, Alef/Hamza and Diacritics. Auto sizing of row heights when multi-line text is entered. documents. This helps to eliminate Microsoft Word errors. New option to specify the path to the Microsoft Word executable (.exe) file. allowing mail merge data sources to be opened, rather than removed. New option to search/replace the Document Template. can lead to document corruption. have more than one copy of Microsoft Word installed. search/replace lists with ExcelPipe and PowerPointPipe. Now can search/replace a form field's drop down choices. applications such as email clients. Now can search/replace inside bookmark names. field codes had been changed or not. New overwrite prompt when exporting grid to Excel/CSV/Tab. Find Only mode - WordPipe incorrectly recorded a search hit. Now handles Unicode in hyperlinks, subdocument names and document properties. Now works with European versions of MS Word. handy for determining the number of files requiring a change. Drag and drop, and Tab/Shift+Tab in grid fixed. Now allows blank search strings to delineate the data. updating during replacements, then all locked fields are restored. Fixed problem with search/replace grid not being recognized. Resolved problem with search/replace pairs being processed twice. Fixed problems handling Word 2002. Now supports Unicode search and replace to support foreign languages. Double-clicking on the list file or the start folder opens it. The Replacement list can now be exported to Excel, CSV or tab formats. Speed improvements - Word screen updating is now disabled. Display of most of Word's message boxes has been disabled. Now replaces hyperlinks inside shapes and inline shapes. Now replaces hyperlinks in the header and footer. search read-only files, and open them as read-only. The log data can now be easily copied to the clipboard. Now handles "Read Only Recommend" documents without any user intervention. instead of a .WPP file. Now allows the user to continue if MS Word is detected with open documents. can avoid FILLIN field dialog boxes popping up. (older versions of Word do not allow these fields to be changed). Fixed Search Inside Field Codes option not working. characters will appear as question marks. Fixed display of evaluation dialog. Word's detection of changes to a document. Skipped Read Only files are now added to the Errors tab. documents are listed on the Errors tab. Fixed default options not being saved. or loaded at run time dynamically from Excel, CSV or Tab-delimited files. list and then import it into WordPipe as required. Double clicking on filename fields opens the file in its associated program. use the same password across a range of documents. New command line options for unattended operation. New Replace Once, and Find Only options. Now allows a semi-colon (;) separated list of file extensions to search e.g. Hyperlinks, Subdocument names, Shapes and Inline Shapes. Now document dates can be retained. Now skips processing Read Only files. Now handles Word 2002 text boxes. Now handles protection passwords (different to open and modify passwords). user if there are any open documents before proceeding. No longer tries to apply the previous protection. modify. These documents are logged to a new error tab of the status window. WordPipe correctly saves all changes. Now searches inside document headers, footers and text boxes. New option to search inside hyperlinks to workaround Word limitations. Search inside field codes now works. Search and replace inside hyperlinks now works. lists can be easily cut and pasted into other applications. Show Tips now defaults to On. Improved handling of large monitor resolutions and resizing. Search field and replace field are now multi-line edit controls. The directory browse button now uses the new Windows style. A new Tip of the Day dialog has been added to help new users. Improved foreign language support for Asian languages. Fixed problem with loading a non-English language. Fixed resizing problems with controls not being visible. New option to search inside field codes. string, a replacement can result in words or sentences being joined together.